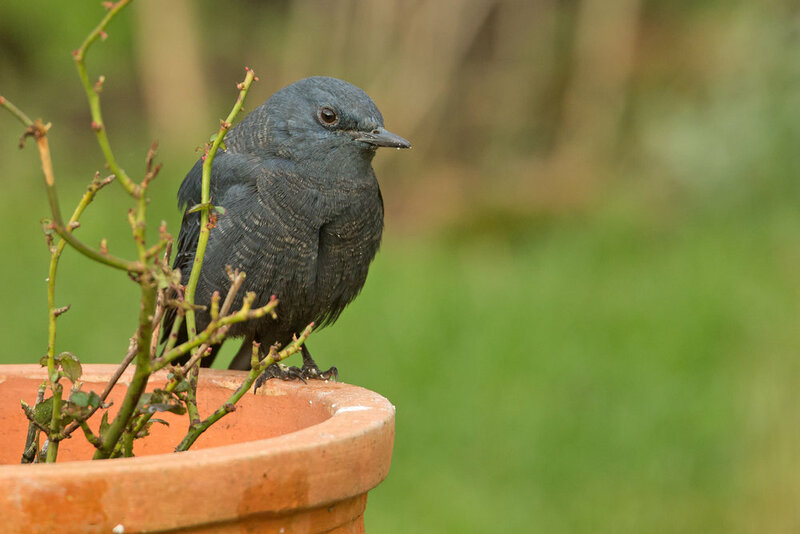 STOW-ON-THE-WOLD HAS BEEN ADDED TO THE ORNITHOLOGICAL MAP with the appearance of this Blue Rock Thrush. Although it is an adult male that should not necessarily mean it is not of wild origin. We get adult vagrants from time to time and if wild then it has appeared on the back of the best ever autumn for eastern vagrants. It is also no more confiding than the birds I see in winter in Oman or India for instance. Let's hope it is from somewhere like Iran rather than a nearby aviary! Although only three hours drive away I could have done without the 18,000+ steps today carrying the big lens and tripod before the thrush made its entrance around midday. The other thing that struck me was how nice the people in Stow are, just like Beeley in Derbyshire earlier in the month. Thanks also to Dan Branch for finding a waxwing, which relieved the boredom of trudging around the back streets of Stow for hours this morning. It looked like it had a rough night in the hard frost. Looking rather scruffy close up.